http://news.jrn.msu.edu/capitalnewsservice/. For technical problems, contact CNS tech manager Tanya Voloshina (248-943-8979) voloshin@msu.edu. SAD NEWS: CNS founder Richard Milliman died March 26 in Lansing. Milliman, who had been the publisher of two CNS member papers, the Three Rivers Commercial-News and the Crawford County Avalanche, was a member of the Michigan Journalism Hall of Fame and the board of directors of the Michigan Press Association Foundation. PROCUREMENT: Michigan ranked ninth in a recent survey of how well state governments buy stuff. The study of government procurement processes assessed how well Michigan spends some $4 billion a year in revenues. By Jason Kraft. FOR GRAND RAPIDS BUSINESS & ALL POINTS. CRUISESHIPS: Muskegon and Duluth are expected to see a boom in summer tourism as more people opt for Great Lakes cruises. The ships cross the U.S.-Canadian border, but cruising will become easier now that there’s a smoother federal security screening process. By Kayla Smith. FOR LUDINGTON, MANISTEE, GRAND RAPIDS BUSINESS, HOLLAND, TRAVERSE CITY, PETOSKEY, CHEBOYGAN, ST. IGNACE, ALCONA, SAULT STE. MARIE & ALL POINTS. COERCE: Supporters of legislation to make it illegal to force a woman to have an abortion say that refusing to have one often leads to violence. Supporters include Right to Life and the attorney general. Opponents include the National Organization for Women, Planned Parenthood and the ACLU. Sponsors include lawmakers from Cadillac, Traverse City, Clare, Levering and Lake City. By Jasmine Watts. FOR TRAVERSE CITY, CADILLAC, PETOSKEY, BIG RAPIDS, CRAWFORD COUNTY AVALANCHE, CHEBOYGAN & ALL POINTS. 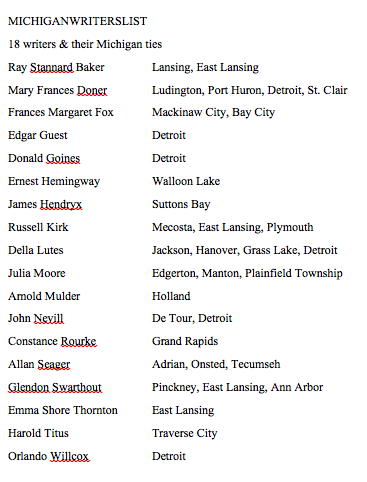 MICHIGANWRITERS: One was named Hemingway. The others weren’t. A few are still widely remembered. Most aren’t. They hailed from Grand Rapids and Detroit, from Mackinaw City and Ludington, from Traverse City and Mecosta, from Adrian and De Tour and East Lansing and more spots in the state. A new book looks at 18 Michigan writers, novelists, critics and poets who shaped American literature, culture and entertainment. By Eric Freedman. FOR TRAVERSE CITY, SAULT STE. MARIE, LUDINGTON, LEELANAU, PETOSKEY, HARBOR SPRINGS, MARQUETTE, ST. IGNACE, CHEBOYGAN, LANSING CITY PULSE, BLISSFIELD, BIG RAPIDS, MANISTEE, CADILLAC, HOLLAND & ALL POINTS. w/MICHIGANWRITERSCOVER: Credit: Michigan State University Press. 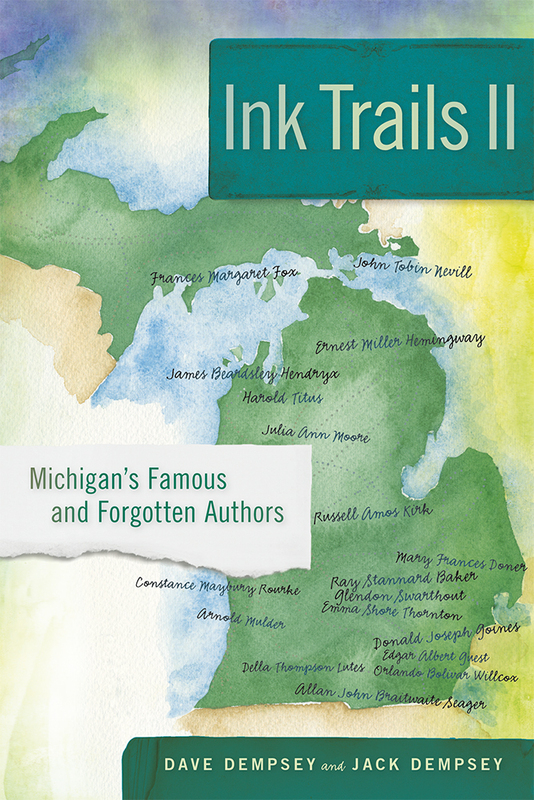 w/MICHIGANWRITERSLIST: 18 writers and their Michigan ties. These riverless areas favor concrete connections over urban parkways. They submerge surface streams, sometimes swallowing entire river systems. “Urban rivers have value, and when cities start to systematically remove them, they remove viable ecosystem services, like flood control,” said Jacob Napieralski, an associate professor of geology at the University of Michigan-Dearborn.